SEAN: A Week of much excitement and prizes! 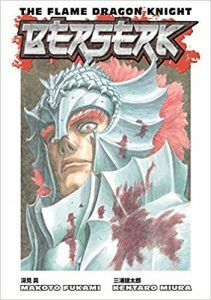 Dark Horse has a Berserk light novel (light? Berserk?) called The Flame Dragon Knight. ASH: Ha! Surprising no one, I’ll be picking this up. SEAN: J-Novel Club has a 13th Little Apocalypse and an 8th Outbreak Company. Kodansha doesn’t seem to have any debuts, but we do get Aho-Girl 12 and Sailor Moon Eternal Edition 4. Digitally there is All Out!! 9, Altair: A Record of Battles 10, Back Street Girls 10, DAYS 13, Kira-kun Today 6, Ran he Peerless Beauty 2, and Tokyo Revengers 6. I’m definitely reading another Ran. MELINDA: Okay, I still haven’t read the first Ran, but I need to! MICHELLE: It has a certain Kimi ni Todoke quality about it. One Peace has a 10th manga volume for polarizing title The Rising of the Shield Hero. Seven Seas has a digital light novel debut with Restaurant to Another World (Isekai Shokudou). I’ve read the manga on Crunchyroll’s site, so am looking forward to a prose version. You can probably guess the premise. ASH: You can probably guess that I’ll be giving the series a try later this year (when it debuts in print). SEAN: They’ve also got the 4th Clockwork Planet novel (print edition), Getter Robo Devolution 3, Himouto Umaru-chan 5, and If It’s for My Daughter, I’d Even Defeat a Demon Lord 3 (manga version). This should have been on last week’s list, but Sol Press have 2nd volumes for their light novels Battle Divas and Strongest Gamer. ASH: I’d forgotten about Sol Press! 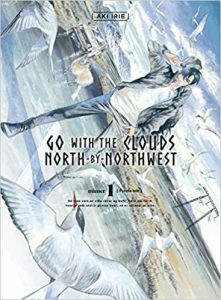 SEAN: Vertical Comics debuts Go with the Clouds, North-by-Northwest (Hokuhokusei ni Kumo to Ike), the newest series from the creator of Ran and the Gray World, runs in Harta magazine, and is apparently as gorgeous as its older sister manga. ANNA: I haven’t read the second volume of Ran and the Gray World yet, but I suspect that series is going to be too male gazey for me, I’ll be checking out reviews of North-by-Northwest. MELINDA: Sign me up for this! SEAN: Viz, as if to say to hold off on Pick of the Week till they show up, debuts a Nausicaa of the Valley of the Wind artbook, as well as a new Junji Ito Story Collection, Smashed. SEAN: And they have the 5th Dead Dead Demon’s Dededede Destruction, the 6th and mercifully final Fire Punch, a 9th Golden Kamuy (which can be as disturbing as Fire Punch was at times, but draws me in far more), and Tokyo Ghoul;re 10. ASH: More Dead Dead Demon’s Dededede Destruction and Golden Kamuy for me! ANNA: I’m excited for more Dead Dead Demon’s Dededede Destruction!